Bottles vs. Cans, Ep. 166 | Beer America TV - Craft Beer in Motion! We at Beer America TV have been talking about it on and off for the past couple of years on our blogs, but it was time to put it to the test. The question, does beer taste better in a bottle or a can? 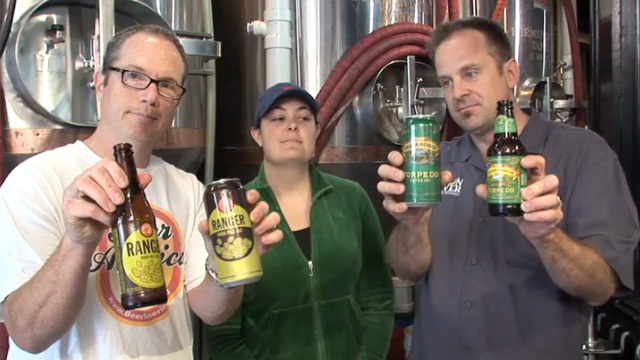 We take two beers, Ranger IPA from New Belgium, and Torpedo Extra IPA from Sierra Nevada, who both bottle and can the same beer, and do a simple blind taste test. One of us got both right, can you guess who? I do not like cans since they have the chemical BPA in the liner. Until they can beer without a liner with BPA in it I will stick to bottles or draft when I am able to. Golden Road Brewery her in Los Angeles http://goldenroad.la/ sells their IPA and Hefe in cans both at the brewery and retail stores. The beer tastes pretty much the same from the cans as it does from the taps at their pub. I think the cans of yesteryear definitely tainted the beer with a metallic taste, but with today’s technology, the cans are just fine. Properly stored bottles and cans that are kept out of heat both do well for storing beer. David, I have dealt with several can producers and none of them use BPA to line their cans. Personally, I prefer beer from a bottle, but cans are good too. Cheaper to buy, fill, and ship certainly makes them appealing. Plus, there is ample evidence that beer stays “good” longer in cans. I’ve also found that there aren’t any real taste differences between bottled and canned versions of the same beer, when both are poured in a glass. You will get some metal taste when drinking directly from the can, but you can also pick up some off-tastes when drinking directly from a bottle, since your mouth comes in contact with both containers. The main thing I like about cans is that the beer is fully protected from light, which can help with aging a beer. As a test, I suggest you put away a sixer of Oscar Blues Old Chub and pop one open every six months. Its richness really increases. And the main reason I also like bottles is that I can re-cap an opened bottle of beer to enjoy later. Yes, I know the later session will have a difference in carbonation and taste, but the changes aren’t big enough for me to not enjoy the beer. I often re-cap a bottle of beer when its ABV is greater than eight percent. My favorite cap is that little white ditty that comes with Martinelli’s Sparkling Cider. It does the job amazingly well. I like the idea of a good beer in a can. It surprises people.